Technology is quickly moving to the forefront of business priorities as organizations undertake digital and IT transformation projects that enable strategic differentiation in a world where users leverage applications and data in new ways. Organizations in all industries must better align with changing customer preferences to avoid being disrupted by a new crop of nimble competitors. Technology will increasingly determine how businesses define and distinguish themselves in the market. 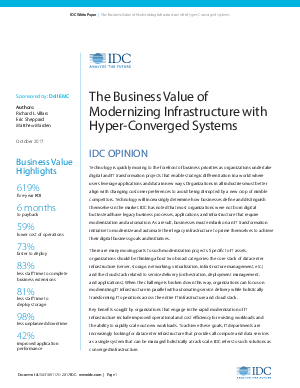 IDC has noted that most organizations were not born digital but instead have legacy business processes, applications, and infrastructure that require modernization and automation. As a result, businesses must embark on an IT transformation initiative to modernize and automate their legacy infrastructure to prime themselves to achieve their digital business goals and initiatives. Intel Inside®. Powerful Productivity Outside. Intel logo are trademarks of Intel Corporation or its subsidiaries in the U.S. and/or other countries.